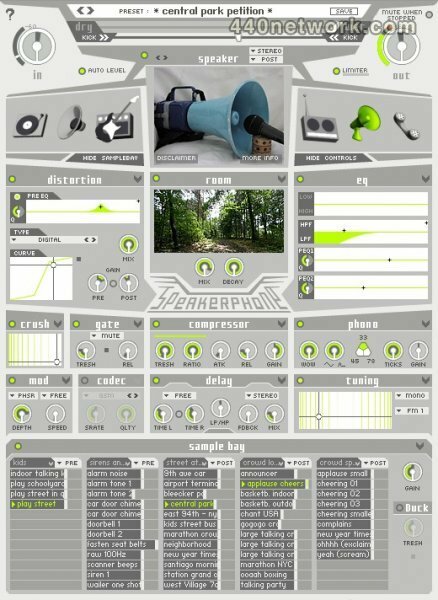 Speakerphone is an impulse-response based speaker emulator, convolution reverb and sample player rolled into one VST, RTAS, MAS and Audio Unit, plugin. It comes with 5G of impulse responses and sample data to help you recreate whatever ambient or location sound characteristic you might need. Installation is simple - there is a main installer to install and authorize the plugin, and two data files (in the download version). Copy protection can be chosen by the user for either challenge response or iLok. Speakerphone offers a couple of options for creating effects: 1) it can take an audio track and route it through its speaker emulator, then an effects section (with convolution reverb/room sim), then allows you to add ambient effects loops or samples to add to the realism; and 2) you can trigger sample pack effects via MIDI, and route them through the speaker and effects sections, or leave some post effects if desired and build a sound effects scenario to match the progression of a scene (e.g. combining both methods of using and audio track, and triggering samples pack samples via MIDI). The possibilities with Speakerphone are practically endless, especially when you factor in automating and triggering effects, parameters, and changes via MIDI to build more complex scene transitions and changes. When inserted on an audio track, send, buss, etc, Speakerphone opens with a mid to large sized configuration window. At the top, is a bank of main presets (with a User preset section) with full ambient/location configurations (such as a radio with bad reception in the next room, or toys in space, etc). The main section of the plugin window includes the following sections: speaker with 6 options for speaker source category in the form of icons; then distortion, room, eq on the next row; followed by crush, gate, compressor, and phono; then mod, codec, delay, tuning, and at the bottom is the sample bay. Each section can be enabled or disabled by a small green dot. Each section also has its' own set of presets. There are additional options at the top for input and output levels, wet/dry mix, and mute during playback (to stop sample loops when your DAW's transport stops). When setting up your own scenario or editing a preset, you will likely start at the top with one of the speaker options. At the center you have a photo icon of the speaker you select, with 3 categories to each side. Speaker emulations can be pre and post effects, and mono or stereo. The six speaker options include turntables, loudspeakers (toys, TV sets, computers, headphones, and misc speakers), amps (guitar, bass, etc), radios, megaphones and walkie talkies, and telephones (cell, handset/landline, etc). Each of those categories includes a long list of options (some categories are larger than others), each of which sounds quite realistic. For example you can emulate the sound of a Canon H12206 fax speaker, Nokia 6600 cell phone, 1957 Franse Philips turntable, 1963 Vox AC30 Top Boost guitar amp, a toy crocodile speaker, Sony Triniton TV, BD770 headphones, and many more. The pdf manual includes a list with photos and descriptions for each speaker, phone, etc. used. But that's just the beginning. Following the Speaker section (which you can turn on or off) is the effects section. Each effect has its own set of presets along with a user preset section. Starting with distortion, this effect allows you to select from ten distortion types (such as mild, digital clipping, analog, fuzz, swift blows, etc), set the mix level, pre-EQ, curve and gain. Following distortion is the room simulator. This is where you setup the ambience of whatever space you need. There are presets for different rooms, etc, but if you click on the room icon, you get a long list of convolution spaces to choose from, including small, medium and large spaces (for example, an attic, a 747, station hall, etc), "through walls and doors", gear, outdoor and resonant enclosures. The reverbs actually sound very good - under gear, there are impulse responses for an EMT 140 plate, and five for a 480 reverb unit. All of the spaces sound quite realistic. Though you only have control over decay and mix for the room, you could even use it for a very nice reverb send if so desired, though that isn't the first intended purpose. Want to put a drum kit in a warehouse? No problem. A cell phone call in the cockpit of MIG? No problem. (A couple of samples are linked at the end of this review). The inclusion of "through walls and doors" makes creating realistic neighboring sounds much easier than the traditional method of working EQ and reverbs hoping to get close in a reasonable amount of time. Ever needed to put a dubbed dialogue line into a kitchen with linoleum floors and plaster walls, and sound like it was recorded via shotgun mic rather than a studio condenser mic? (Yep…and it would have been much easier with Speakerphone). While there isn't a kitchen specifically in the room sims, you can get there much faster in Speakerphone using other similar rooms (bedroom, office, bathroom, etc) than creating it from scratch. The EQ section includes a high and low shelf, high and low pass filter, and two parametric EQs which work well for tweaking the location response character of the sound you are looking for if not exactly created by a preset speaker, room, etc. Additional effects such as crush (bit reduction), gate, compression, mod (chorus, tremolo, etc) and delay are more traditional but include presets to simulate several specific situations. The Phono section adds wow, and ticks (scratches) to simulate a record player (which would be most useful with the turntable speaker sim). There is also a sample pack of turntable effects, such as scratches, etc, to add the realism (and since these can be sent pre-effects, you can put the effects through a turntable speaker). Two additional effect sections are codec and tuning. Codec gives you several phone/audio encoding codecs, such as GSM, CELP and a couple of unique effects. Tuning simulates the sound of an FM or AM radio an x-y window you can drag around to vary the tuning accuracy (which can be automated to simulate tuning a radio dial). The last section is the sample bay. This section includes five identical sample playback bays or inserts. You can insert a full pack of effects from the included sample packs, which are broken down into ten categories, including people, transportation, nature, rights free music, electrical and mechanical effects, radio and phone effects (beeps, scanning, etc), and more. You can setup loops of ambient space noise, such as a people in a pizza restaurant, then add the sound of a stereo or night club next door (the music loops are rights free for just such a use), along with a cell phone beeping, and perhaps a piece of machinery running in the background. You have five playback instances to setup with any of the ten categories, and either choose a loop to run continuously, or trigger individual effects. Each sample loop or one-shot sample in each bay has a vertical bar to the right that you can drag left or right to change the relative volume of that sample. There is no separate pan for each sample or sample bay - just an overall pan for the sample bay section. Most all parameters in Speakerphone can be automated via MIDI, and with the sample bay, you can also trigger effects in each bay via MIDI notes. Of course, this is all within one instance of Speakerphone. You can easily run several instances on a PC or Mac with a decent cpu and ram. On a single dual-core cpu computer you should be able to run more than 20 instances of Speakerphone alone (depending on audio track and additional plugin loading), should you need to setup multiple scenes without doing any switching of setups via automation. Speakerphone is a fantastic tool for creating locations, scenarios and effects, with a wide range of flexibility and possibilities. With the inclusion of a diverse set of sample packs, one could easily create a full scene with one instance of Speakerphone alone, but with multiple instances and MIDI automation/triggering, the options are even more impressive. Of course there are no rules as to what simulations and effects you use together - sending a crowd talking through a low resolution GSM codec with a gate might be the perfect sound for a two-way radio with a bad connection or spotty reception. I found myself wishing Speakerphone had surround support. Though not always necessary for most currently typical post effect uses (which could often simply be creating mono sources/dialog), it would be nice to have. In addition, the lack of panning for individual sample bays makes using multiple instances necessary even for some simple scenarios (there is a global level setting for the sample bay, which in conjunction with gain outputs from effects sections can be used to balance a pre-effect sound with any post effects sounds). For example, if you want to have a a stereo playing in the room next to a restaurant (see the sample below), then want to add a cell phone ringing, you would have to use a separate instance of Speakerphone (or a cell phone ring sample) to control the level of the cell phone vs. the next door stereo and restaurant ambience. While not a big deal, it would certainly make creating such scenarios in a single instance that much simpler. I also came across a bug with the guitar amp sim such that it would start emitting sustained amp noise while sitting idle, or while selecting a preset for most any effect or sim in another instance of Speakerphone. Selecting the guitar amp sim again in the problematic instance would usually stop the amp noise, but it would intermittently burst when first opening the preset window for most effects sections in other instances as well. I'm not yet sure whether this is an issue with Speakerphone or Nuendo 4.1. If you are in post for film, video, broadcast, or even a musician looking for a creative tool to put your audio in specific situations, Speakerphone should be at the top of your list of purchases. It won't cover every single effect need for any given feature film, but for many post houses, it would be a powerful addition and time saver. Speakerphone is a plug-in from AudioEase. AudioMIDI is a leading US relleser who also provides great information about a plethora of products commercially available for creating and recording music with a computer.